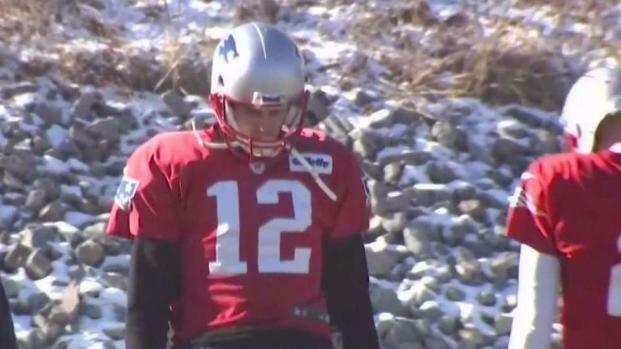 Tom Brady was spotted at Patriots practice on Thursday wearing gloves, but the team's official injury report released later in the day said he did not participate. 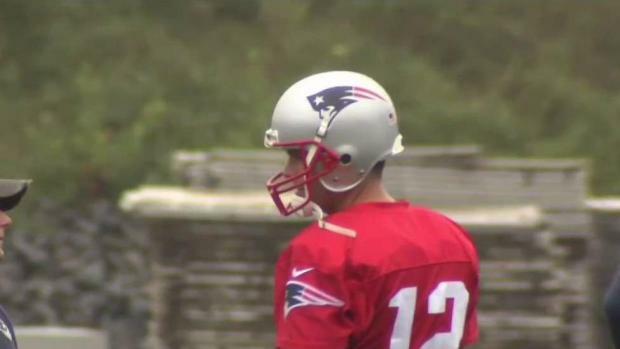 New England Patriots quarterback Tom Brady appeared at practice Thursday, but did not participate due to his right hand injury. Brady reportedly jammed his throwing hand at practice Wednesday when a player accidentally ran into him, according to the Boston Herald. X-rays showed no structural damage, and barring anything unexpected, Brady is expected to play in Sunday's AFC title game against the Jacksonville Jaguars. 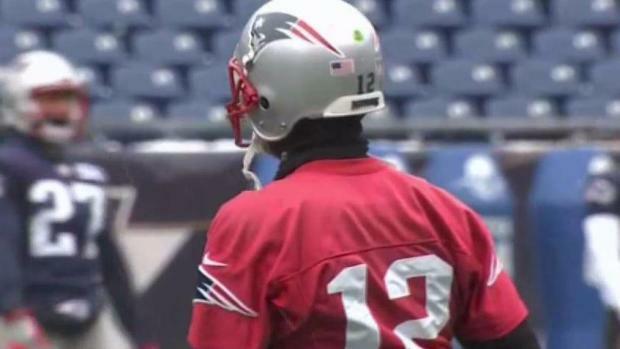 Brady was spotted at practice on Thursday wearing gloves, but the team's official injury report released later in the day said he did not participate. He was originally scheduled to speak to the media at 3:30 p.m., but the team announced around 2:30 p.m. that he would address the media on Friday instead. It was the second straight day that the team had cancelled Brady's scheduled session with the media. 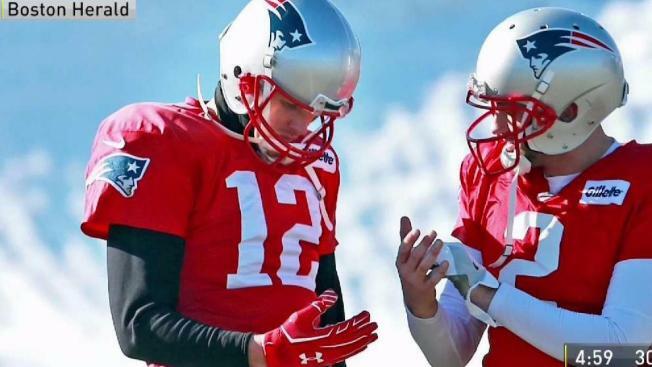 Most Patriots fans around Boston agree: Tom Brady will still play this Sunday and New England will still win the AFC Championship game, despite Brady's hand injury. Brady was one of four players scheduled to speak to the media on Wednesday, along with head coach Bill Belichick. But after tight end Rob Gronkowski, safety Devin McCourty, special teams star Matthew Slater and Belichick had all finished at the podium, there was no Brady. Just as Belichick was finishing his remarks, the Patriots tweeted a message, saying, "Tom Brady is with our medical staff and will not be available to the media today." Diehard Patriots fans were unshaken that the quarterback abruptly cancelled his press conference. Brady was listed as a limited participant at practice on Wednesday. He has shown up on the injury report several times throughout the season with various shoulder and Achilles injuries. Though Brady didn't speak Thursday, Patriots center David Andrews did. He said he snapped balls to all of the quarterbacks at practice, but wouldn't answer when asked if Brady threw the ball. "You can ask him how it went," he said. Andrews also had little to say about how Brady hurt his hand. Tom Brady was a limited participant in practice for the Patriots Wednesday after a right hand injury. "I'm not a doctor or anything like that," he said. "I am just focused on what I have to do to get ready this week. I don't really remember." The only other player to speak Thursday, McCourty, also failed to shed any light on Brady's injury. "I don't know," he said when asked how Brady was injured. "I was playing defense." Patriots fans said they're worried about the injury, but aren't panicking yet. "I think they will win even with his injury," said Bruce Storer of Foxboro. "I think our offense is just too big for their defense." "It's a huge concern," added Steve Haynes of Norfolk. "I mean without him, who are our quarterbacks now?" Most fans agree, though: Brady will still play on Sunday, and the Patriots will still win. "He has three or four days to heal up here," said Bob Carey of Foxboro. "So I wouldn't be concerned at this point unless we find something more drastic." "I just think it's a precautionary thing and gamesmanship on the part of the Patriots," Bobby O'Shea said. "They're not gonna give Jacksonville any advantage they can get." "They're gonna win, that's the only thing I know," Tony Ringuil said. "I guarantee they'll win. They'll probably win by 14 points...he's the champion. Patriots are meant to win." Even Massachusetts Gov. Charlie Baker weighed in, issuing a "personal guarantee" that Brady will play on Sunday. The third-seeded Jaguars will face the top-seeded Patriots on Sunday at 3 p.m. at Gillette Stadium after defeating the favored Pittsburgh Steelers 45-42 last weekend. The Patriots punched their ticket to the title game with a 35-14 drubbing of the Tennessee Titans. Brady jammed his throwing hand at practice when a player accidentally ran into him, according to a Boston Herald report. They did have x-rays done, and those showed no structural damage. The Patriots have made it to the AFC championship game for seven straight seasons. New England has advanced to the Super Bowl in three of the past six years.